Summertime is almost here - a time to get out and enjoy your walking even more. There's a lot more people using the paths now so it's time to show a little patience and practice some common courtesy. A little bit of each makes walking a more enjoyable experience for us all. You can do simple things. Things like yielding to oncoming walkers and cyclists when the path is narrow, staying to the right hand side of the path or obeying signage on the path. Some paths are marked with lanes for walkers and lanes for cyclists. They work best if everyone obeys them. If you need to rest try and get off the walking path. (If there are benches along the way use them). When you meet friends and you want to chat, get off the path too so you don't block anyone. Help your community stay green and pick up any garbage you see as you walk. Every little bit helps! 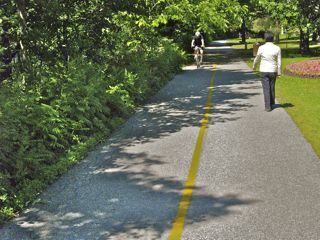 If you walk where you share the path with cyclists stay alert and 'stay in your lane'. Some cyclists will ring their bell to let you know they are coming and the more experienced, courteous riders will also shout out which side they will pass you on. Whenever you hear a bell and someone saying 'On Your Left', that means they are approaching you from behind and will pass you ON YOUR LEFT. Do NOT move to your left. Hold your lane. Remember to follow their direction first, then check if you have time. Remember that some cyclists can be moving at a fairly good speed. By the time you turn around they may already be on top of you or by you. Be cautious and be aware of your surroundings. You might even come across dogs and other pets, so be on the look out. It's always a good idea to see if the pet is on a leash. And it's probably a good idea not to pet these animals no matter how friendly and cute they may appear. You can read Bob's story here about what can happen. Most importantly remember to say ”hello” to your fellow walkers and maybe even flash a big “hello smile”. Make it a habit. You will find yourself becoming friends to many good folks as you walk for fitness and health. There’s nothing like a friendly greeting to get your spirits up. Having trouble keeping motivated with your daily fitness walking? It's so easy to let things slip if you don’t keep on top of making it a daily habit. Just remember one thing...whenever you miss a day or two, don’t feel guilty. Just get back on track the next day. Grit your teeth and know that it’s not so hard to get back to routine again. If you need a little more encouragement why not revisit our Daily Motivation page? It is designed to help keep you on track. Have a great summer - hiking, walking or running. Let us know about any adventures that you encounter. We would love to have you share your outdoor experience with us and others. Have a great summer...happy walking, everyone! Folks write to us with some very interesting questions through our Contact Us page. Often these folks don't feel they are ready to ask their question on our Walking and Hiking Stories page just yet. (We feel a bit differently and feel all your stories and situations are worthy of a place on those pages too)! I stumbled onto your site when I was looking for informational resources available for fitness walkers, runners and joggers. I really appreciate the quality and depth of your content. The reason for my research is I have been providing self defense products on safety information online for over 15 years now. We have lots of customers write or call our customer service department asking for security items for protection against loose dogs and assault while exercising outdoors. I have written a few articles about basic safety tips to follow when walking outdoors for fitness. I was wondering if you would publish an article like this on your website? Any article I provide you would be a unique content article that would not appear anywhere else online, including my own website. There would be, at most, two outgoing links to my website that sells self defense items. These articles would be focused to your site's audience and would be informational in nature. Thank you for contacting us at 50 Plus Fitness Walking. We are certainly open to the idea of working up a section on safety for which your article would be a good fit. Tell us more and let's keep a dialogue going. Let us know if you would like to see more information on safety and security as mentioned by Meg. Just Email Us and share your thoughts.